Encased in bouncy, blue orbs, teams huddled up as best their rotund shape allowed them before a match at Seattle's first "Bubble Futbol" - or soccer - tournament Sunday, September 7, 2014, at Cal Anderson Park in Capitol Hill in Seattle, Washington. The unlikely sport originated in Europe and is quickly sweeping the U.S., with a recent spotlight on The Tonight Show with Jimmy Fallon. The event was put on by Seattle-local nonprofit "The World is Fun" as a celebration of the organization's fifth anniversary. Before the first match, players tested out the "crash-ability" of their bouncy, blue orbs during Seattle's first "Bubble Futbol" - or soccer - tournament Sunday, September 7, 2014, at Cal Anderson Park in Capitol Hill in Seattle, Washington. The unlikely sport originated in Europe and is quickly sweeping the U.S., with a recent spotlight on The Tonight Show with Jimmy Fallon. The event was put on by Seattle-local nonprofit "The World is Fun" as a celebration of the organization's fifth anniversary. Players struggle to gain access to the center of their bouncy, blue orbs during Seattle's first "Bubble Futbol" - or soccer - tournament Sunday, September 7, 2014, at Cal Anderson Park in Capitol Hill in Seattle, Washington. The unlikely sport originated in Europe and is quickly sweeping the U.S., with a recent spotlight on The Tonight Show with Jimmy Fallon. The event was put on by Seattle-local nonprofit "The World is Fun" as a celebration of the organization's fifth anniversary. 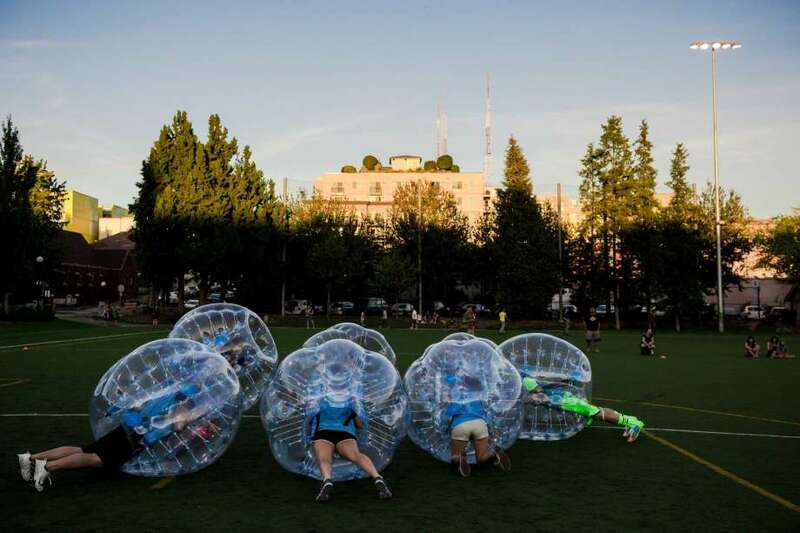 Players push downfield, often to collide, while encased in bouncy, blue orbs as part of Seattle's first "Bubble Futbol" - or soccer - tournament Sunday, September 7, 2014, at Cal Anderson Park in Capitol Hill in Seattle, Washington. The unlikely sport originated in Europe and is quickly sweeping the U.S., with a recent spotlight on The Tonight Show with Jimmy Fallon. The event was put on by Seattle-local nonprofit "The World is Fun" as a celebration of the organization's fifth anniversary. Encased in bouncy, blue orbs, participants took part in Seattle's first "Bubble Futbol" - or soccer - tournament Sunday, September 7, 2014, at Cal Anderson Park in Capitol Hill in Seattle, Washington. The unlikely sport originated in Europe and is quickly sweeping the U.S., with a recent spotlight on The Tonight Show with Jimmy Fallon. The event was put on by Seattle-local nonprofit "The World is Fun" as a celebration of the organization's fifth anniversary. A participant towels away the sweaty condensation from the center of a blue orb following a match at Seattle's first "Bubble Futbol" - or soccer - tournament Sunday, September 7, 2014, at Cal Anderson Park in Capitol Hill in Seattle, Washington. The unlikely sport originated in Europe and is quickly sweeping the U.S., with a recent spotlight on The Tonight Show with Jimmy Fallon. The event was put on by Seattle-local nonprofit "The World is Fun" as a celebration of the organization's fifth anniversary. Orbed players fail at a high five attempt during Seattle's first "Bubble Futbol" - or soccer - tournament Sunday, September 7, 2014, at Cal Anderson Park in Capitol Hill in Seattle, Washington. The unlikely sport originated in Europe and is quickly sweeping the U.S., with a recent spotlight on The Tonight Show with Jimmy Fallon. The event was put on by Seattle-local nonprofit "The World is Fun" as a celebration of the organization's fifth anniversary. Teams come together following a match at Seattle's first "Bubble Futbol" - or soccer - tournament Sunday, September 7, 2014, at Cal Anderson Park in Capitol Hill in Seattle, Washington. The unlikely sport originated in Europe and is quickly sweeping the U.S., with a recent spotlight on The Tonight Show with Jimmy Fallon. The event was put on by Seattle-local nonprofit "The World is Fun" as a celebration of the organization's fifth anniversary. The closest thing to a "header" players got at Seattle's first "Bubble Futbol" - or soccer - tournament Sunday, September 7, 2014, at Cal Anderson Park in Capitol Hill in Seattle, Washington. The unlikely sport originated in Europe and is quickly sweeping the U.S., with a recent spotlight on The Tonight Show with Jimmy Fallon. The event was put on by Seattle-local nonprofit "The World is Fun" as a celebration of the organization's fifth anniversary.